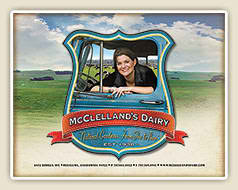 Life on McClelland's Dairy: Welcome to our Family Farm! Our family farm was started back in 1938 by my grandparents Robert and Lillian McClelland. 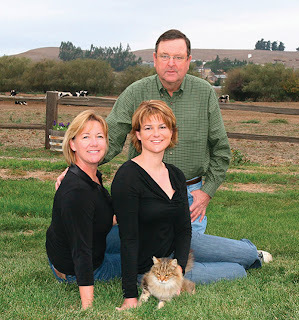 They bought the farm from a Swiss Italian farmer who was milking eight brown swiss cows. They milked the cows by hand, bottled the milk, and delivered it to local households. Fast forwarding to current times, the farm is still a family operation, consisting of myself, my mom and my dad (Dora and George). We milk 800 organic cows on a ranch west of Petaluma in the coastal Sonoma County hills. With the grass fed organic cows milk, we make some of our own dairy products, including European Style Organic Artisan Butter. Furthermore, we have started hosting farm tours for our customers. On the tour, people can learn all about the history of the farm, pet the babies in the nursery, watch the cows being milked, and even milk a cow by hand! After the tour, taste our organic artisan butter and browse through the farm store. I look forward to sharing our family farm with you! !